Attorney Stephen M. Bennett has been with Helms Robison Lee & Bennett, PA since 2008, and is a partner of the firm. 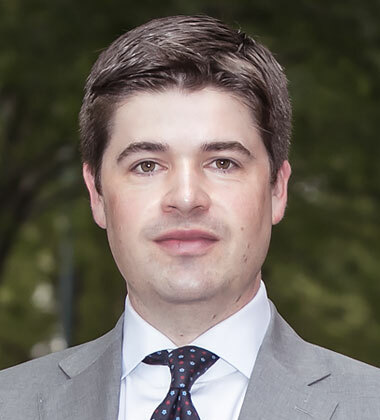 He received his law degree from the University of South Carolina School of Law in 2008, and became a licensed North Carolina attorney that same year. In law school, he received the academic CALI Award for Real Property, Administrative Law, and Family Law. Additionally, he was an Articles Editor for the ABA Real Property, Probate, & Trust Journal. Prior to law school, Stephen received his bachelor’s degree with a major in Chemistry in 2003, and his Masters in Healthcare Administration in 2005, both from the University of South Carolina. Prior to his licensure, Stephen worked as a summer law clerk for Haynsworth Sinkler and Boyd, P.A. in Greenville, South Carolina, and Womble Carlyle Sandridge & Rice, LLP in Greensboro, North Carolina. He has also worked with the South Carolina Department of Health and Environmental Control, and Yellowstone National Park. Stephen’s main practice areas include General Litigation, Personal Injury, Business Law, and Real Estate. He is currently a member of the North Carolina Bar Association, the North Carolina State Bar, and the Union County Bar Association. Stephen was also named Business North Carolina’s Legal Elite in 2017 in the field of Litigation. Stephen grew up in Marietta, South Carolina. He met his wife in law school, and they now reside in Waxhaw, North Carolina with their son. Stephen enjoys mountain biking, hiking, camping, and skiing.